Ever thought your makeup was perfectly natural looking at home, only to be shocked at how garish it looks in the bathroom mirror at the office? To prevent such shocks and actually know how you will look during the day, it is good to check your makeup in different kinds of lighting. Hopefully, you will be in more flattering lighting, you will likely be in worse lighting sometime during the day, but your vanity lighting is likely a more flattering light than you will encounter during the day. So an adjustable light is a great thing to have on a makeup table. 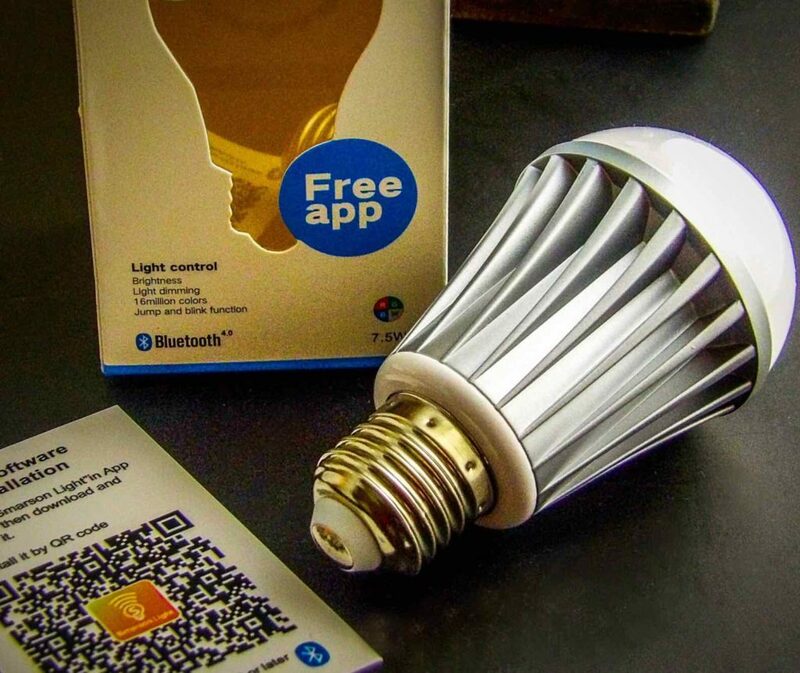 I like Smarson Bluetooth LED Light Bulb for this purpose. 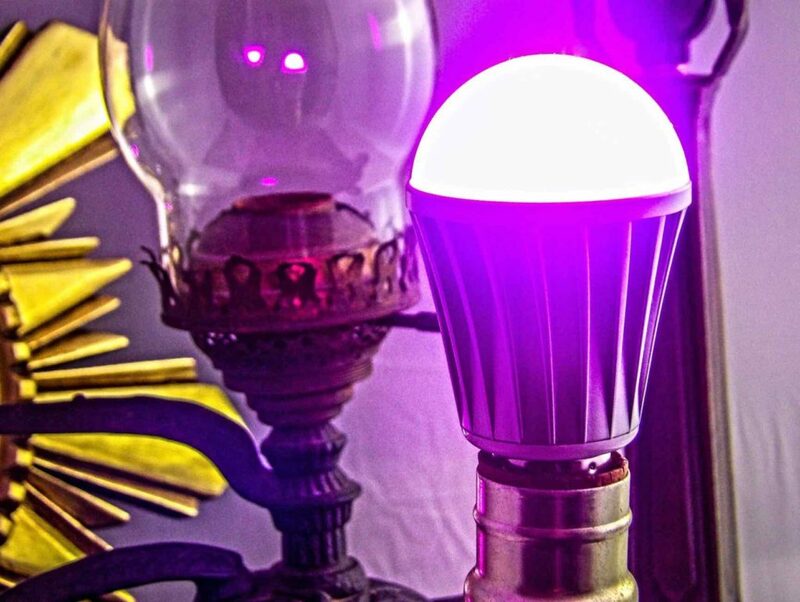 As the name would indicate, it is a LED Light Bulb with Bluetooth connectivity. 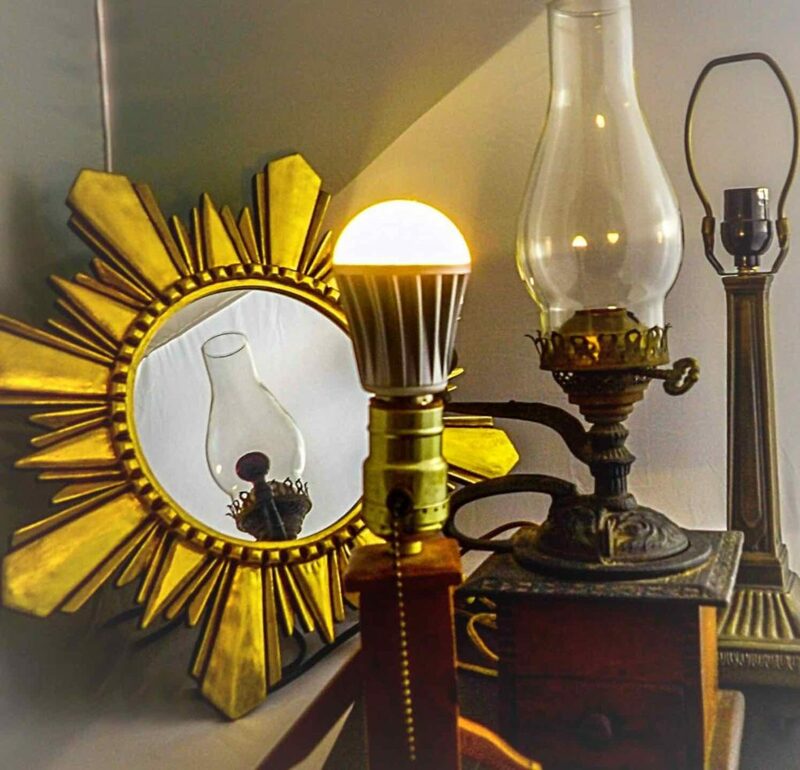 Better yet, it can be used in any standard socket – I’m able to use it in my great-grandmother’s table lamp that is already on my vanity table. 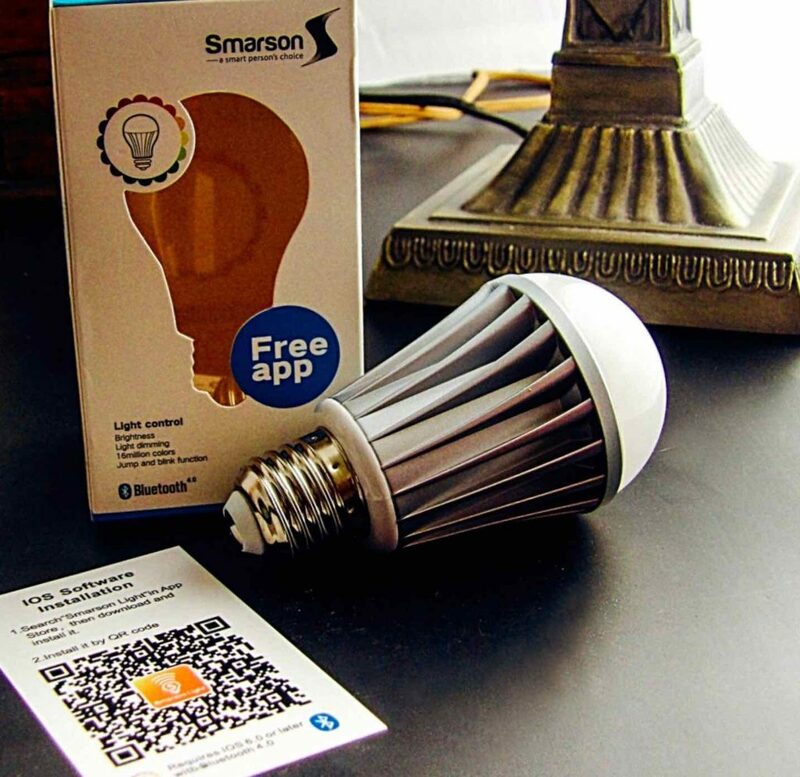 The features of the bulb are controlled by the Smarson App, which is available for both iOS and Android. It is a free download, and it is both easy to set up and highly intuitive. I have the Phillips Hue system, but there is so much more flexibility with the Smarson Light Bulb system. Additionally, the quality of the light is much better: with the Smarson system, the colors are deep and rich, and can be subtly tweaked to whatever lighting scheme you are seeking. First, you can pick the color from a color wheel of 16 million colors, and then change the brightness of the colors. There are pre-programmed functions like cross-fade for dynamic color shows. Second, there is a programmable timer feature. Want to fall asleep to a certain soothing color? 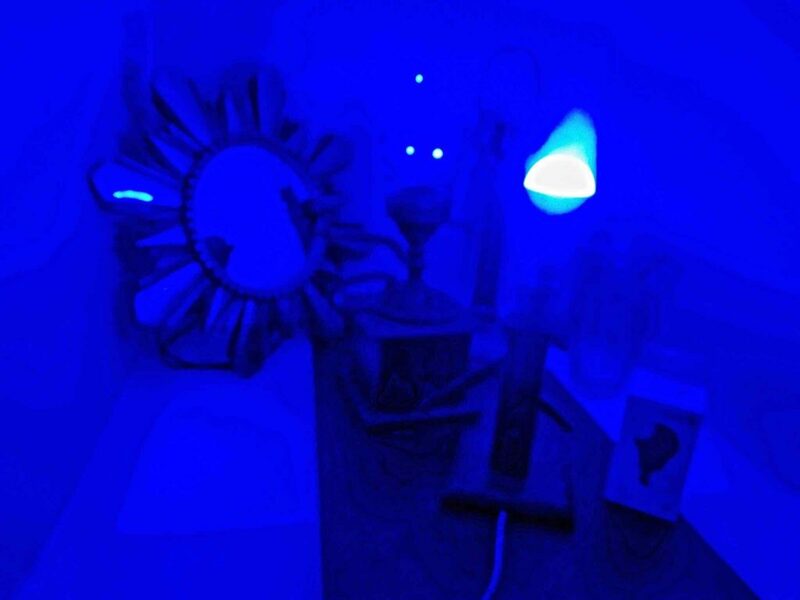 Want to have a bright light in the house when you get home from work? You can program all of that quickly right from the app. Third, this is an energy saving bulb. I am amazed that so many features and such powerful lighting are built into an energy efficient device! I adore the camera feature, which allows you to take a picture of an object, and the light will match it. It is great if you are looking to coordinate your outfit, or you want to check how you will look in a particular light. I am impressed by the amount of deeply saturated light that the one bulb produced. For events such as a wedding, consider purchasing enough of these bulbs to illuminate your venue if you can decorate the space yourself. Find a friend with a good eye to control the lights throughout the event. Since each light can be controlled individually from the app, you can create different lighting schemes for different areas, or change them all at once (the app can control five lights at a time.) You can change the lights through the night, with various colors for the meal, dancing, cake, etc. A professional lighting team would cost thousands, and you can use these bulbs yourself after the event. You can even sync the lighting to your music, which is a great feature. Find this handy lightbulb at Amazon. My masseuse has this incredible sound system in the treatment rooms. I am no stranger to epic sound systems for my equally epic digital music collection, but the ones I have tried in my at-home spa are always a little tinny. 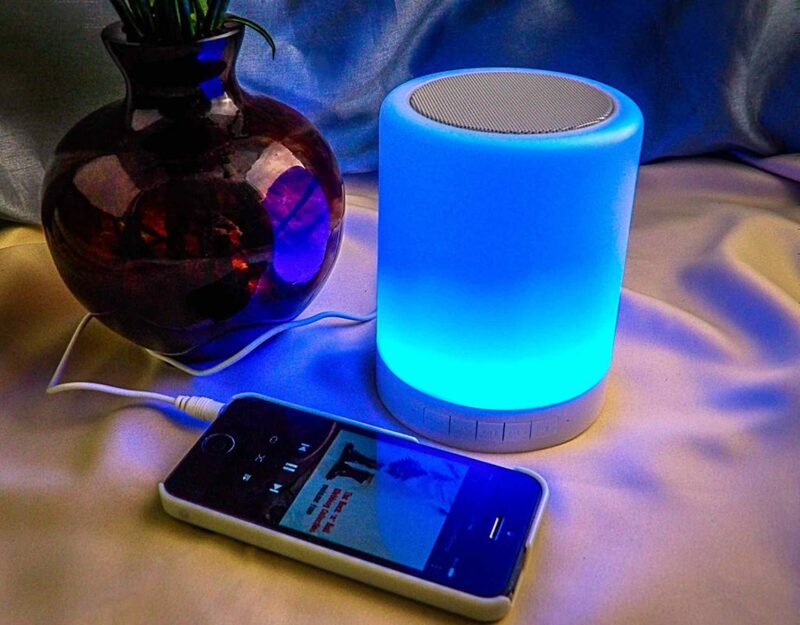 So I am thrilled to find the ZHOPPY 2-in-1 Night Light and Bluetooth Speaker. I have a dedicated (and always evolving) playlist for when I’m relaxing during an at-home spa treatment. So finding a speaker that has great sound and works with my iPhone, which is where I keep my playlist, has been my aim. 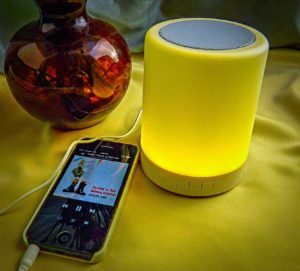 When I first took the ZHOPPY 2-in-1 Night Light and Bluetooth Speaker out of the box and saw the size of the unit, I didn’t have high expectations of a deep, robust sound, or a soothing light. But this small Nightlight and Speaker packs a lot of power into a small unit. The light is deep and saturated, and the sound is absolutely amazing. When I think of a nightlight, I tend to think of a light that is just bright enough to orient yourself when you see it in the corner. The ZHOPPY Night Light produces just enough light to be able to very gently illuminate the room, but not as much as a bedside lamp. It isn’t enough to read by, but it is bright enough to provide a soothing glow. The color of the light is easy to change: simply tap on the top and side on the device at the same time. The color will change immediately to another soothing shade. Keep repeating the “double tap” motion to find the hue that suits you. To increase or decrease the brightness, tap the speaker grid on top. One of the options is to turn the light off completely. This is convenient if you like complete darkness during the night (as it does aid sleep), but would still like to have a nightstand option for light if needed, or a lower level of light closer to bed. The sound is incredible. The first time I tested it out was late at night when everyone else was asleep. I pressed play, and the loud, crisp, deep bass rang through the house as I quickly scrambled to turn it down. I did not expect such amazing audio from a small device! It is comparable to a speaker system I have with a pretty decent subwoofer. The device is powered by a rechargeable battery that lasts impressively long between charges (I have only had to recharge it once in about two weeks) and it is easily charged via USB, which is convenient. I have mainly been using the Auxillary mode for audio, however, so the battery life might be shorter if used in Bluetooth mode, which I only used for a few hours. I’m quite happy with this small but powerful device for its soothing light and its powerful speaker for my beauty treatment relaxation time! 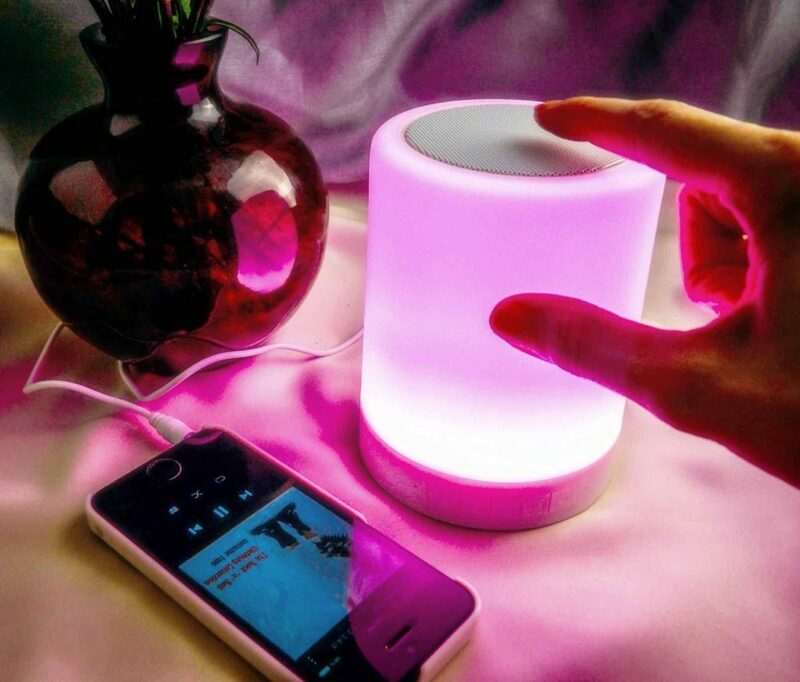 Find the ZHOPPY 2-in-1 Night Light and Bluetooth Speaker at Amazon.com. Thanks to my Amazon Kindle, I’m an avid reader of ebooks. My e-reading falls into two categories: books or PDFs I read for work and pleasure reading. Either way, I want my reading to be a pleasant experience that doesn’t strain my eyes. Think of all the other ways that screens have permeated our lives: watching a Netflix movie on a tablet, late night browsing, or the infamous middle of the night Instagram check. 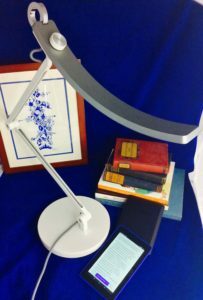 That is why I am thrilled with the BenQ E-Reading Lamp. This lamp is sizable enough to cover a large area with light but has a slim line to it. The sleek design is adjustable, so if you are doing intricate work (like beading or digital editing), you can focus the light on your work. 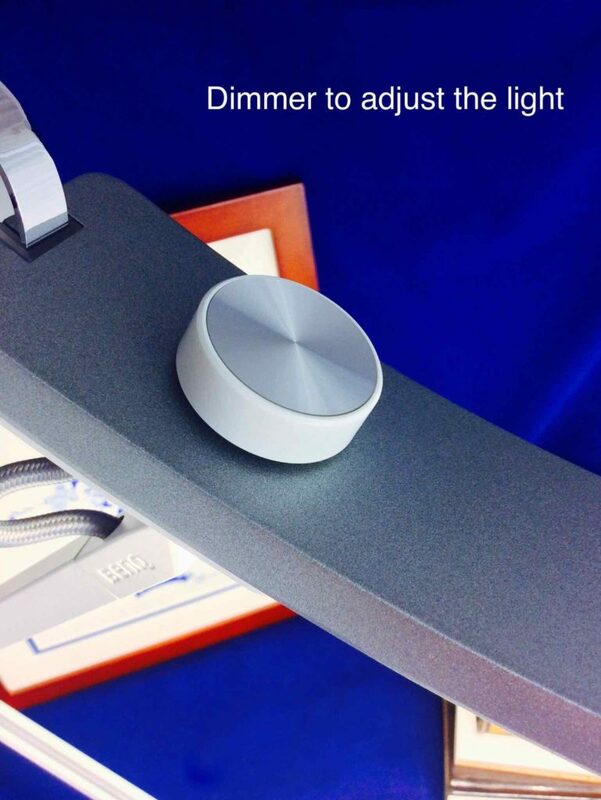 With just a tap on the ring, the lamp switches between warm white light and cool white light. Much like the Night Setting on tablets, this adjusts the light for the time of day and the activity in which you are engaging. This is a really nice feature, as most lamps just have one setting, but this lamp takes in the “human factor”. It also responds to the ambient light and adjusts accordingly. Some might question the price of this lamp. Considering how much computing affects vision, I think the price is quite reasonable compared to worsening vision and the associated risks of long hours at the computer, including headaches due to flicker or glare. Additionally, lack of proper lighting when using computers or tablets can lead to bad posture, which can cause a whole slew of health issues. So this lamp is priced quite reasonably when you consider the cost to health. 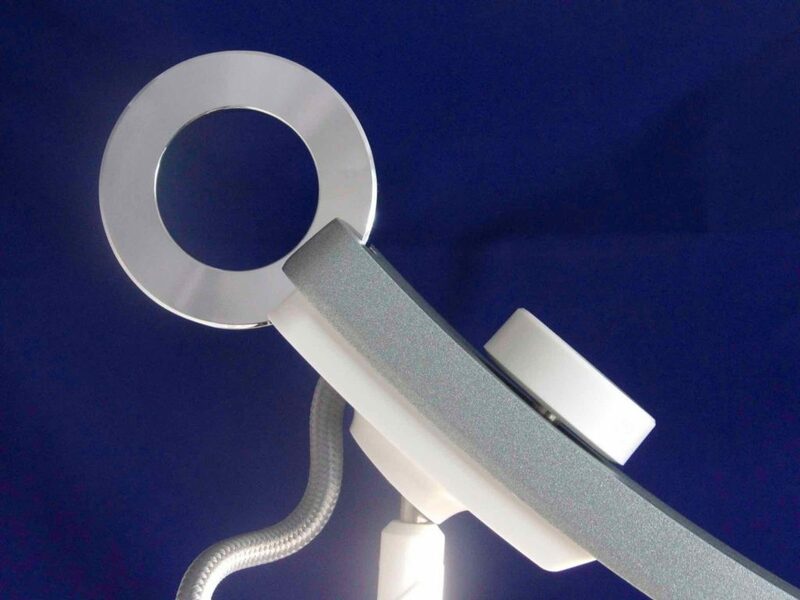 Additionally, the price is competitive with other lamps with such a sleek design. I plan on buying another one to put in my office on my desk. I really am thrilled to have discovered this lamp. I received this product in exchange for testing and review purposes. If you have any questions about my experience with it, leave it in the comments section below, and I’ll do my best to answer it! I have a friend whose office always smells like a Spring day. She’s an artist who has paints in her office that decidedly do not smell like a Spring Day. When I asked her about this, she pointed to the Himalayan Salt Lamp on her desk. 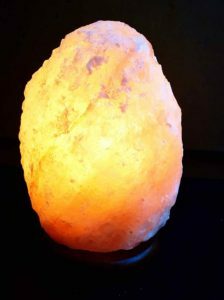 The theory is that Himalayan Salt Lamp produce negative ions that give off that lovely smell you experience after a rainstorm. 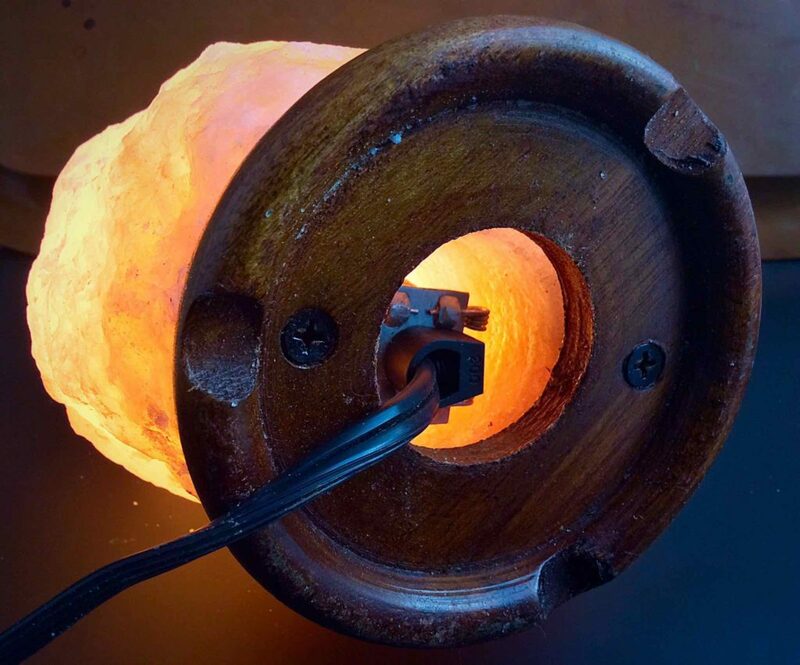 Unlike the Negative Ion Towers you find at gadget stores, Himalayan Salt Lamps require zero upkeep and produce a soothing light. 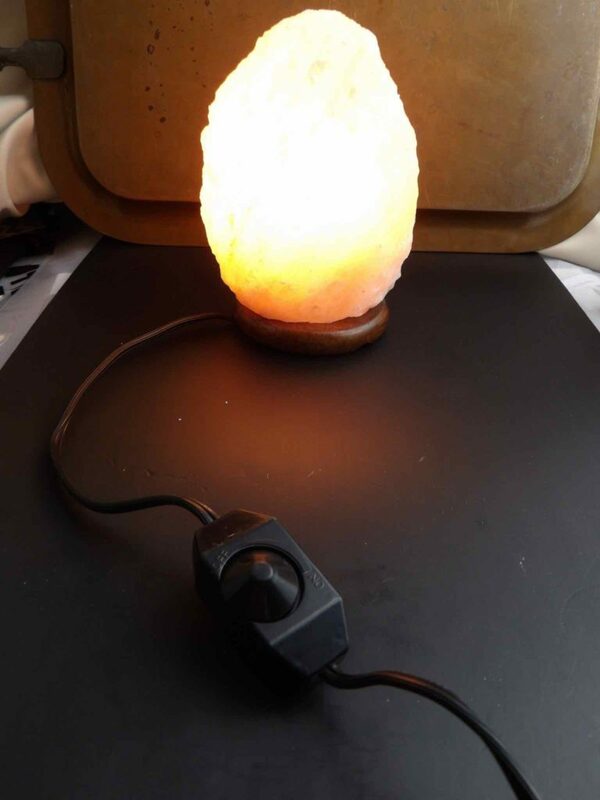 Himalayan Salt Solution’s Salt Lamp produces a beautiful pinkish-amber glow. 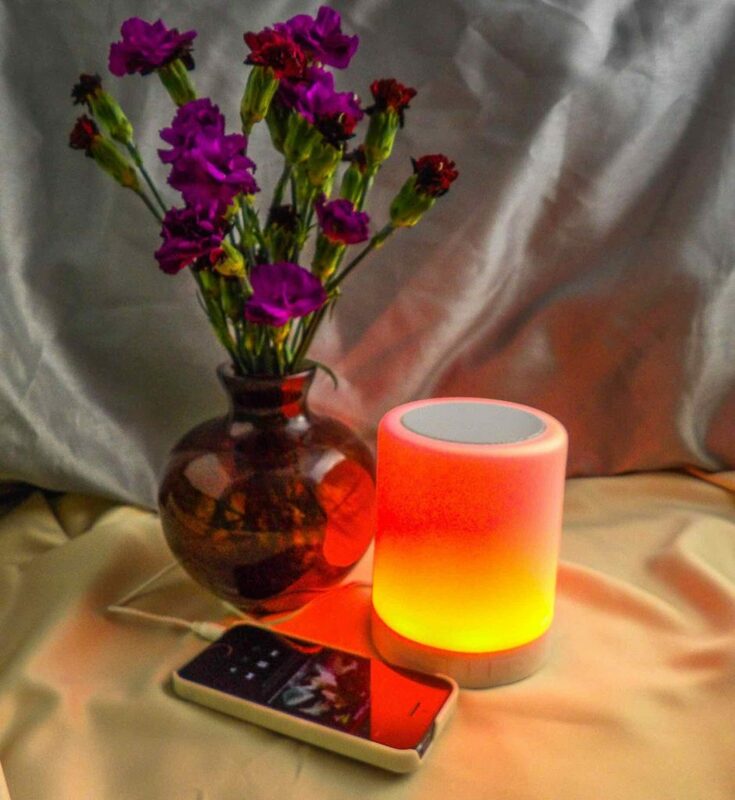 It’s not bright enough to light up a whole room, but it is enough light for an at-home spa, or to add a beautiful glow to a room at night when you are winding down. It does add a nice freshness to the room, although this size lamp won’t freshen up a large room. But it certainly gives my desk area a pleasant scent. The lamp comes with an extra bulb, which is nice. Instead of just having an on/off switch, it has an adjustable dimmer. The cord is a generous 6 feet, which gives you the ability to place it optimally. It really is a lovely piece. You will notice small flecks of salt that come off of the piece. This is normal, and in fact, a sign that this is a high-quality piece of Himalayan Salt. It’s not a problem, just something to be aware of. I received this product at a discount in exchange for testing and review purposes. If you have any questions about my experience with it, leave it in the comments section below, and I’ll do my best to answer it! The perfect vanity table: the unattainable goal. 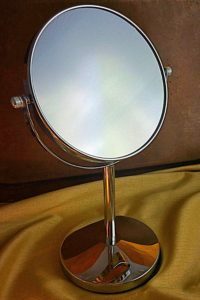 A vital component to any vanity table is the tabletop swivel mirror. But not just any mirror. It must be a true and clear reflection. It must have a regular side for makeup application and a magnifying side for eyebrow tweezing and other close-ups. And ideally, it should look aesthetically pleasing on your vanity table. Modern, sleek, stylish and classic. The Oak Leaf Tabletop Swivel Makeup mirror is a two-sided mirror with a 5x magnification side for close-up work, and a regular side mirror. Very useful for fine detail work such as eyebrow grooming and tweezing, applying false eyelashes or detailed eyeliner work, or examining the pores of the skin, the magnification side is very helpful for grooming. I like using the magnification side for when I apply retinol or Vitamin C serums so that I can better view skin problems that may not be otherwise as visible to the naked eye. The regular mirror side is clear and even without a warped reflection, very suitable for both men and women for shaving, grooming, skincare treatments and of course, makeup application. I like that I can tilt it in just the right position (about 75-degree angle back, away from my eye) while I apply liquid eyeliner and mascara to my top lashes. The Chrome finish gives a clean, modern yet classic look to the mirror, and serves the purpose of protecting the mirror from moisture and condensation. The chrome makes it very suitable for use a bathroom vanity or countertop mirror as it will resist corrosion from the steam of hot showers. The actual assembly of the mirror is simple, and it comes with a small tool to help secure the fittings. The swivel mechanism moves effortlessly and is firmly secured. 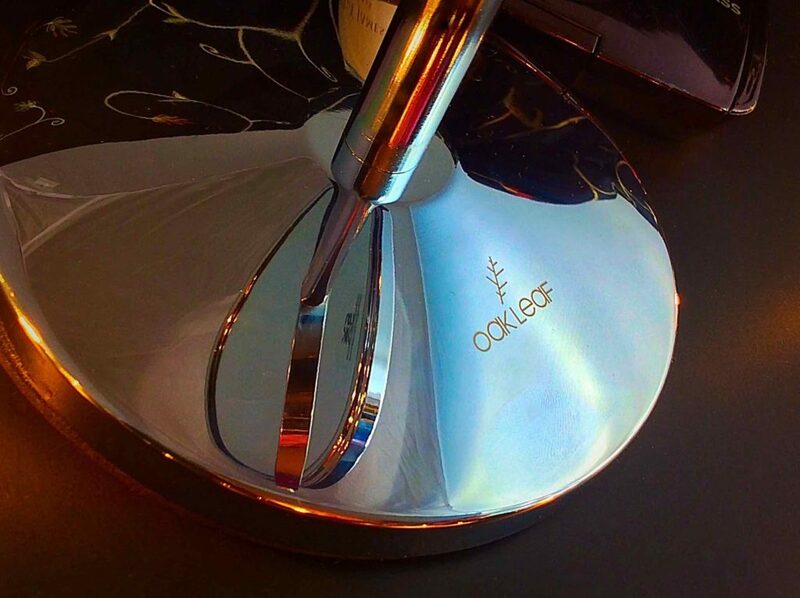 The base is solid brass with a hand-polished chrome overlay that gives a high, sleek shine. It is not rickety and feels like a more expensive piece. The mirror comes not entirely assembled. At first, I was less than thrilled about this, but assembly is simple, and it turns out I prefer that the mirror was not preassembled once I realized that if it were already assembled, it probably would not arrive in as good a condition as it did when I received the mirror. Not fully assembled allowed for packing each piece very well with no scratches. Even if you are not terribly handy, this is very easy to assemble. CONCLUSION: Well worth the price, this mirror has a classic, sleek look that would compliment the decor of many bathrooms and vanity tables. 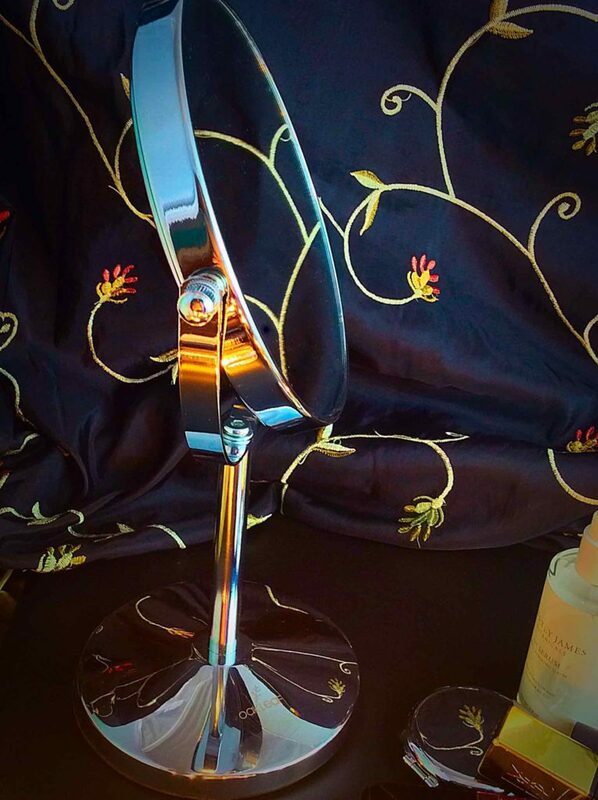 The easy to use swivel base is very helpful for shaving, makeup application, and skin care needs.